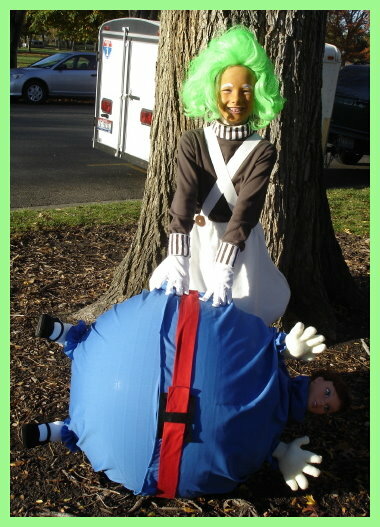 This has been a favorite movie of mine since I was a little girl, so when my daughter agreed to be an Oompa Loompa, I went for it. I made the pants using a simple child pants pattern and added "humps" to the sides. To make them stiff, I used a couple layers of interfacing. I then attached ribbon for the straps. The top is a purchased brown turtleneck. For the neck and wristbands, I used white "sweatbands" and painted brown stripes. I did the same for the socks, but bought brown socks and painted white stripes. The wig was a Marilyn Monroe wig that I spray painted green. Here face was painted orange with white accents. But, I didn't stop there. I also saw the need to make Violet Beauraguarde as the blueberry. I did this by using an exercise ball. I then made basic clothes to fit the ball. For the hands and feet, we bent wire and taped it securely to the ball and covered with socks, shoes, and stuffed gloves. For the head, I bought one of those head only dolls that you can style her hair and securely attached it to the ball as well. If you don't have the time or the inclination to MAKE a costume for an event like a School Play or a Parade. If you've thought about it, but your heart, for whatever reason, JUST isn't in it...You can probably purchase a costume of the type you were planning to make...and maybe even for about the same as you might spend on the materials to MAKE a costume. On the other hand, you may look around and spot a Costume that changes your Costume plans completely Ü.